Theoretically, summer will return to the polar-vortex-battered Northern Hemisphere. What are you looking forward to doing this summer? It was a terribly long winter in New England. In fact, if I was still living in Vermont I’m sure I’d be shoveling the snow away from the house to see if the daffodil bulbs were pushing through to the sun. I did that one year because six inches of snow was still on the ground on April 1st. I thought, if I didn’t see green grass I’d never see the summer. What I’m most looking forward to this summer started this afternoon, sitting on my porch swing. My husband made it late last fall so the amount of time to enjoy it was limited. I sat on it earlier today with the mid-afternoon sun warming the breeze the comes across the porch. 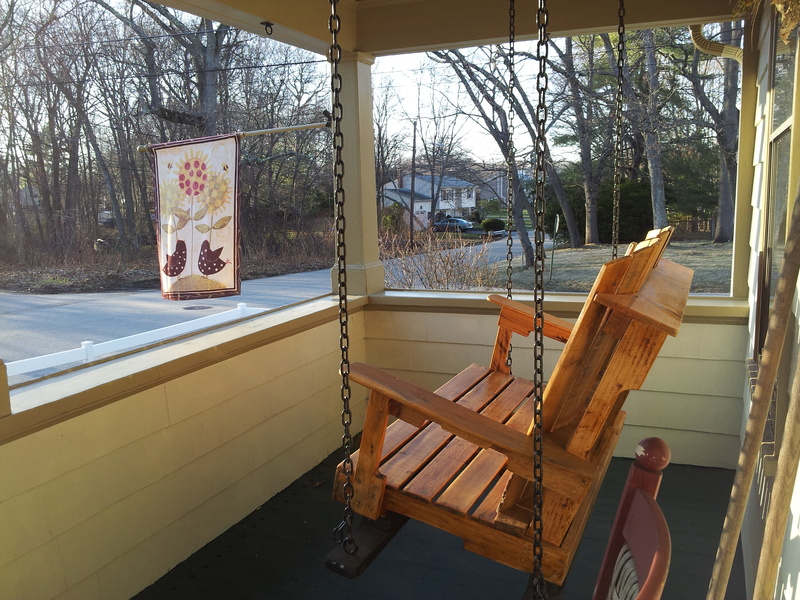 You can see from the picture that the swing is suspended from the ceiling of the porch. As it goes back and forth it feels as if I’m floating and not swinging. Neighbors walking their dogs, kids going to the ball field at the end of the road, cars up and down the street with windows open and “Happy” blaring from the radios; seeing and hearing all that this afternoon has me looking forward to swinging on my front porch. Oh, and the thanks today goes to my husband for making me the swing. Dark Wings and Peacock Hope: Daily Prompt | ALIEN AURA’S BLOG: IT’LL BLOW YOUR MIND! I hope you’ll have a wonderful summer,best wishes to you.